Overall summary: Only go here if you want to truly know what the word ‘inhospitable’ in the Hospitality Industry truly means. The owner of this establishment was rude, defensive, and worst of all – knowingly endangered my sister and I which led to physical harm. Stay away!! 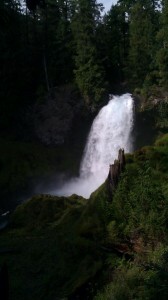 I purchased the “Escape to McKenzie River Mountain Resort” through LivingSocial.com. This was to be my last big blow out before going in for a thyroidectomy. I booked our cottage for the last weekend of September for my sister and I go stay there and go trail biking and kayaking. Needless to say, our experience was short of a living hell. a.	I am 5’10” with a very long inseam. My sister is 5’5”. They tried to give us the same size bike. I made them give me a larger bike. I happen to have a lot of road biking experience (which I know doesn’t translate over to trail), but I do know a properly sized bike. They did not. b. 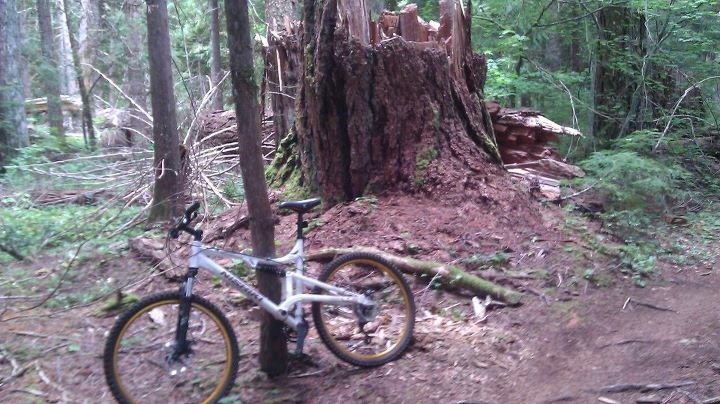 The mountain bike rentals were literally pieces of trash. The bikes barely worked and they tried to give my sister a broken bike. The pedal on my bike was broken and ended up scratching the heck out of the back of my leg. 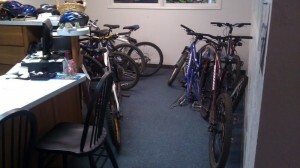 The bikes are banged up and covered in dirt and barely shift. c.	They do not know how to maintain their rental bikes. The rear derailleur was obviously broken on the bike they tried to give my sister and they did not know how to fix it. I finally pointed at another bike and made them give her that one. d.	Note that these bikes are to be used on a remote 26 mile trail where we will get NO cell reception. Therefore, it is critical that the bikes are in working order. e.	No water bottle holders on the bikes. They said they didn’t have any at all, but I saw one on a bike in the junk pile (see photo) and they moved it onto one of our bikes. Bring a camelbak. We go into the cabin (which are pretty nice and roomy and well decorated), and when I exit I see some guy coming towards me. I introduce myself and he just stares at me, and then grunts something about filling out paperwork. It's like Jurassic Park but without the dinosaurs. While filling out some paperwork, I ask several questions about the area, the living social deal, etc, none of which he can answer. I asked what we should see in the local area, where we could get food (you need to bring your own food), etc, but he could not answer those either. We lucked out and got great advice down the street at the Hot Dog stand. Later in the day I meet the proprietor, who for some unknown reason decided to go into the hospitality business but has the worst chip on his shoulder I’ve ever seen. I tried to mention my poor service experience, since he was the owner, but instead he got defensive and stated that it was my fault for coming early, and they don’t have the staff to provide full coverage as they are a small business. Uhm.. sorry, but running a “resort” is a 24/7 job, you should have people trained to work the front desk, and since you are a small business, then you should be able to more effectively communicate with your staff. I tell him that my sister and I are complete trail biking novices. We have NO experience. Is the McKenzie River Trail easy, I ask? He says it is easy to moderate, and recommends bearing right on a part of the trail to avoid the difficult part. OK, great. Next day he grudgingly takes us up (we had paid for FOUR van trips with the LivingSocial deal, only one of which got redeemed) to the top of the trail. The trail is apparently a BLACK DIAMOND. My sister and I had to walk our bikes for six miles, and my sister got hurt repeatedly. Even I took a spill and got tore up by the crappy bike pedal. Having to see my sister in pain, bleeding, miserable infuriated me. We both took time off of work to fly up to Oregon and were so excited. And now here is my little sister, bleeding! I couldn’t believe it. The proprietor knowingly endangered us. He knew how rough the trail was. I was VERY clear that we were beginners. The next day, I confronted him about this (in front of one of his VERY KIND ex-employees, who’s name I did not catch, but we love her). Me: Have YOU RIDDEN the trail? Me: AND YOU THOUGHT IT WAS OK TO SEND MY SISTER AND I, WHO WERE COMPLETELY UNSKILLED, ON THAT TRAIL? Him: Well, the other times I tried to dissuade people, they never listened. Me: You never tried to dissuade US and I was HONEST. I would have listened! At this point, my poor sister said she had enough and wanted to leave immediately. The living social deal also provided a $50 gift certificate in the “resort’s store, but she didn’t want to face the proprietor again and wanted to leave immediately. While packing to leave, we get a knock on the door. The proprietor sent his OWN CHILD to deliver an apology letter (to be scanned and posted). The child sticks out a letter and mutters ‘sorry’. I didn’t know what to say so I just took the letter and said ‘okay’. Chris LaVoie – I hope you read this. Man up. Don’t send your child to do YOUR work. That is just sad. I can tell that the only reason I got this letter is because the awesome ex-employee saw the exchange and told Chris he was in the wrong. The owner tried to blame the LivingSocial deal, saying that all the people who had used it were also “disappointed” with the trail. I can understand that there was apparently a miscommunication with LivingSocial – there were NO kayaks as advertised and the trail was made to sound very easy. 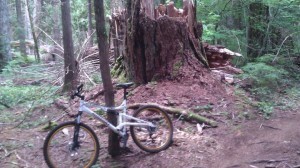 But I still say that the proprietor, who has actual knowledge of the trail, should have warned us. I have emailed LivingSocial with my complaint as well and won’t be purchasing any experiences from them again. Start your ride south of this landmark! This trail IS beautiful, it is amazing. 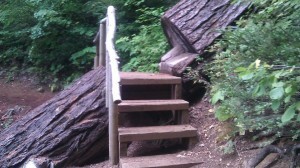 But unless you are very experienced, do NOT start the trail at the top!!! Start the trail at the parking lot where you can hike two miles north to the blue pool (and do that hike, it’s so beautiful). 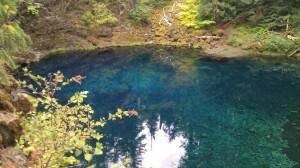 Also make sure to go to the hot springs and do the waterfall hike on the other side of the McKenzie River. Wow, this area is spectacular and I can’t recommend it enough. Wow! The total lack of customer service is shockingly bizarre. That place really needs someone to take it over and clean it up because the area looks just remarkable. A real shame the owner and employees are totally useless.